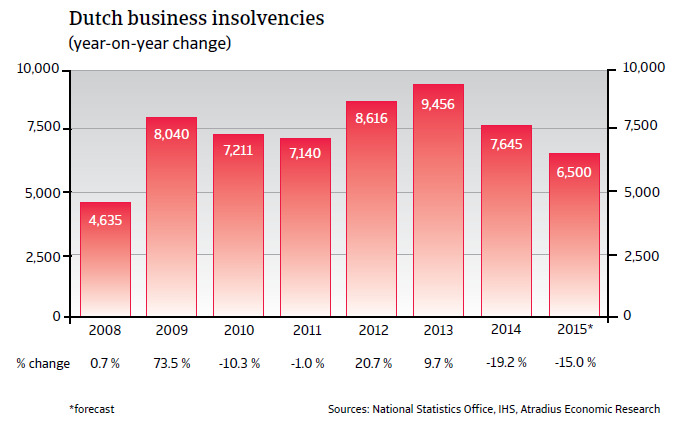 The economic slowdown in 2012 and 2013 triggered increases in business insolvencies of 20.7% and 9.7%, respectively, to around 9,500 cases in 2013. Due to the economic rebound, business failures decreased by 19.2% in 2014, and are expected to decline further in 2015, to about 6,500 cases. However, this figure is still very high when compared to 2008 (4,600 cases), the year the global credit crisis started. 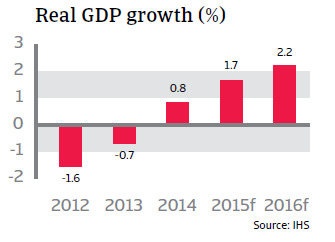 Following a 0.7% contraction in 2013, the Dutch economy recorded modest growth of 0.8% in 2014. The rebound is expected to accelerate in 2015, by 1.7%, with export growth accompanied by a recovery in private consumption, industrial production and investment. The Dutch economy strongly benefits from lower oil prices, which offers relief to both consumers and businesses. At the same time the lower euro exchange rate should help to spur exports. 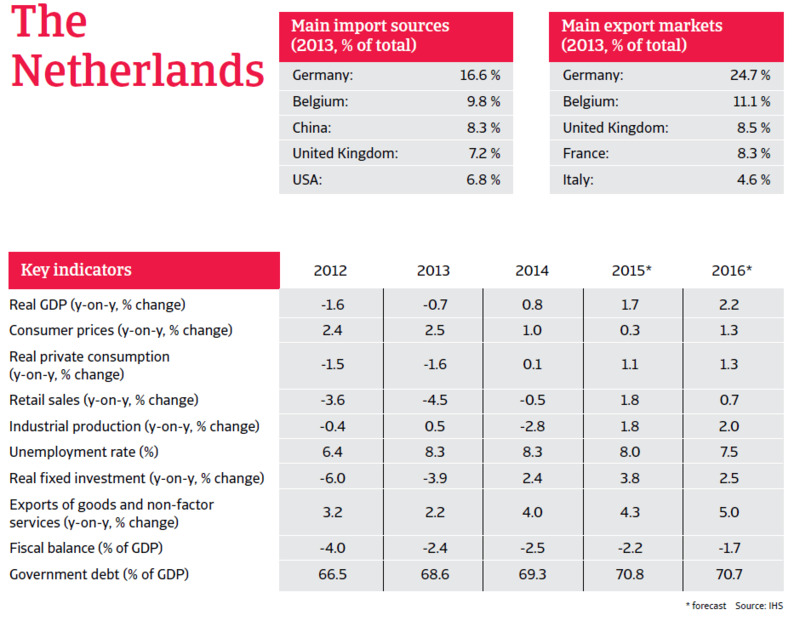 Given that the economic rebound is still highly dependent on exports, the outlook for the Netherlands remains susceptible to repercussions from on-going geopolitical tensions and the fragile eurozone recovery. Subdued consumer spending was one of the main reasons for poor economic performance in the last couple of years. 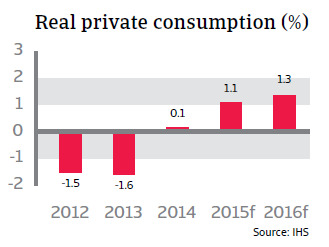 Private consumption is expected to grow 1.1% in 2015 after three years of contraction/subdued growth, as households’ purchasing power increases, inflation remains low and unemployment slightly decreases. Dutch households will remain cautious with their expenses though for the time being, given the slow recovery of the property market, the still high average debt ratio of households and the fact that unemployment, forecast at 8.0% in 2015, remains high by Dutch standards. Business confidence is slowly improving and industrial production is expected to grow 1.8% in 2015 after a 2.8% contraction in 2014. 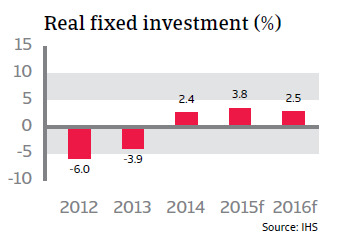 Real fixed investment growth is also expected to accelerate to 3.8% after rising 2.4% in 2014. Business investment should increase on expectations of an improvement in both the domestic and international economy. 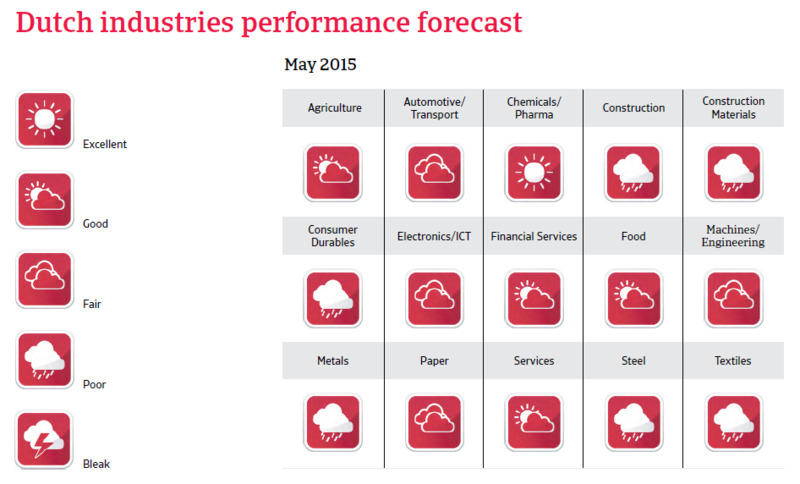 Export growth is expected to accelerate to about 4.3% in 2015. The Dutch government has passed a number of austerity measures to trim the budget deficit. These aim to cut expenses by reducing spending on healthcare and social security benefits as well as to increase government earnings. 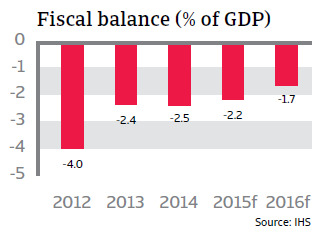 It is expected that the budget deficit will remain below the 3% Maastricht threshold in 2015 and 2016. Government debt is expected to increase slightly to 71% of GDP.